I am using my Audio Technica M35 with this amp. Bias it to 6V, which is half of 12V. exactly there. I notice that it is kinda bright, warm but not as warm as certain tube amps(according to my friend). What sound signature should I get from it... warm? If I make it to 5.5V will it change it so that it is not so bright sounding? and previously I mentioned about my troubles of getting a good power supply... and I think charred the CCS resistor. It's a blue coloured resistor but it is slightly brown... will that change the sound? You can change the resistors with higher wattage, i/e 1/2 or even 1 watt if you like. There will be no sonic difference. Some folks swear that metal film resistors sound better than carbon, but in this amp there is no real difference. You have to remember that this amp is running at about 5% of full B+ voltage. 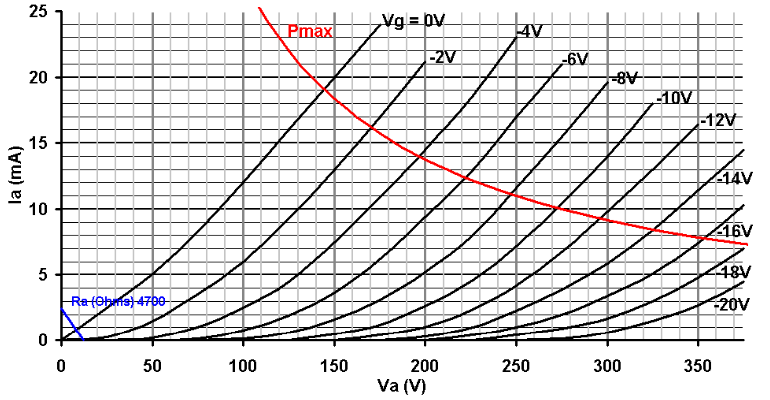 If you look at the tutorial you will see the tube graph and this amp operates in a little teeny part of the graph. So it will not sound as warm as other amps i/e Soha or kurt strain amp. You can increase the value of the input coupling capacitors to 4.7uF, but I think you will see more bass response by using some closed back headphones. Sennheiser has some HD 203's for about $30, they are great for listening to the computer or ipod. Also as your amp "burns in" the sound will become warmer, but it takes some time. You can do a google search on capacitor burn-in. I have had my amp on continuously since the beginning of this thread, it sounds great with my Grado SR 60's. oh, but what happens to a charred resistor? resistance goes up or down? is this charred till it needs a change? I am afraid desoldering and re-soldering might change the sound a lot. B+ voltage? what is it? 'you will see the tube graph and this amp operates in a little teeny part of the graph' you mean because we only use up to 12V of the tube? and not higher? if it is so, can we tweak it to run higher? just asking so that I learn bit more. but re-soldering isn't a good idea... the board is full of components now... hard to re-solder. But here, I want to ask how are the Audio Technica A500, A700, A900 series? the closed back one. are the bass response good? is the any chance that you have heard it? Might just rebuild the whole amp, if I got time... and get the MOSFETs and CCS to the casing to make it cooler. I noticed cooler it is for the MOSFETs and CCS the warmer it sounds and it won't be so bright. capacitor burn-in? how long will that take? it takes on all 3 capacitors? and will time makes the tube degrade? so, you have never turn off your amp at all? and here I want to say thank you for replying and teaching me here. Thanks! 1st of all thank you guys for your help. I have a 3300 uF 35v capacitor that i will be using to filter out AC ripple from the power supply. and now i have another question. I ordered my parts and unfortunately the company was backordered on the type of pots used in the schematic for bias. U guys stated that a 4.7K resistor can be used to substitute the 2 pots.. How would i place that on the board(because there are 3 pins on the pot, and idk how i would go about putting a fixed carbon film resistor on...)to substitute the pots? U guys stated that a 4.7K resistor can be used to substitute the 2 pots.. How would i place that on the board(because there are 3 pins on the pot, and idk how i would go about putting a fixed carbon film resistor on...)to substitute the pots? has a nice convenient knob on top that allows you to vary the resistance. So if using a fixed resistor you just wire it inline. to settle for a tube of some other origin, all bets are off. Hi Guys managed to get the time to assemble my prototype amp it came out pretty good . The amp sounds pretty good im still burning it in and its still changing. Changing the input caps from 2.2uf to 4.7uf improves the bass in my instance. would be able to make an all in one amp i just have too many power bricks for things already . all AC transformers and all simple rectified Wall Warts. i was thinking of lifting the signal ground with a resistor away from the "sewer ground"
Fortunately i have alot of SMPS and its silent with most but would like to solve the filtering problem to make it more friendly any ideas or diagrams ? . I am sure this would help out alot of new builders as not many are as fortunate to have a box full of PSU's to try and it would become slightly frustrating. you say mind if we stop and go through this dumpster when something catches your eye . i had no Turn on / Turn off thump i think this was due to the onboard PSU sucking back the juice from the caps ,all it did was fade in fade out. Its stuck between 2 bits of right angle aluminum at the mo till i find a chassis design i like i also have a analogue VU meter buffer circuit to stick in for that old school look . Many thanks again must go to Roggom for a great project ! What a fine build ...it looks great, i like it. Answer to both koogar and santik. About hum problems, power supply noise and ordinary wallwarts, it's important to use a power suplly with a voltage high enough to allow you to filter down, the power supply ripple which usually shows up as hum. I've tried different wallwart power supplies, with outputs between 20 - 33 VDC, rated at 1000 - 1500 mA and made three RC filters after each other, to get a 12 - 12,6 VDC PS, with good results. The problem can and will often occur when using low voltage wallwarts ex. 12 - 15 VDC, because it will only be possible to make a voltage drop of few volts, which for this class-a circuit is not enough to avoid unwanted hum and noise. So, my advice will be ....find some wallwarts, with a relatively high voltage and filter it, until the hum and noise is all gone. (You don't have to spend a lot of money. I found some of my wallwart power supplies, at the recycling place ). Note 1: It's important to use large power resistors (I use 5W or 10W ceramic types), for the RC filtering, because the voltage drop will draw some current. It will cost some heat, to get a humfree PS, thats the truth. You can use this Ohm's Law Calculator to size the resistors. One of my NP-100v12 amp's are using a SMPS ( Switch Mode Power Supply ) for the time being. It comes from a dead HP laptop, with an output of 19 VDC 7,89 A. I don't know about sound ( better or worse than ordinary wallwarts ), but it's totally and absolutely humfree. I think SMPS's are good for some purposes, but i won't go saying that they are great for everything. Wow. What a beautiful build!! You can also use two 20R 1/4W or 1/2W resistors in parallel to make a 10R at 1/2W or 1W respectively. I would suggest using metal film as they don't change resistance as much as carbon types do when they heat up. koogar, great looking amp. Congrats. Your amp is a work of art. Great job!